Hyper offers its users to manage a Personal Contacts list, that does not include Clients or suppliers of the user, but only contacts for personal usage. 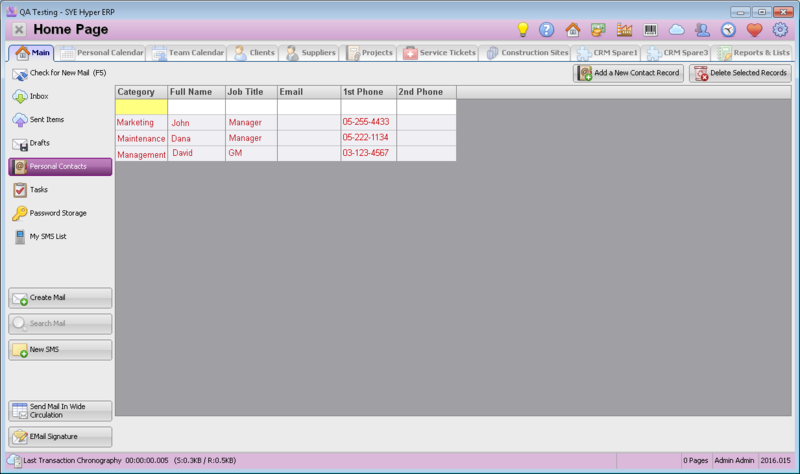 This table displays the users list of personal contacts. These contacts will not have any Hyper card and therefore will not have any documentation or filing in the system. Additional information fields can be added to this table, according to the users needs. Double click on a Contact person to open its card. Create a new contact person. In the new contact person window, fill in the relevant details. Delete the personal contact person. Deleted contact person can not be restored.